Okay, this is the FIRST e*Knowledge step...skilling-up with your electronic vehicle, your computer. *Buying A Computer - Hardware Basics* Remember, EVERYONE started in the same place as you. The only difference between us here is TIME and EFFORT. However, you will need to know this... "That little pop-out thing with the hole in it (your CDROM drive) is NOT (just) for holding your coffee cup. :-) (joking!)" CPU (Central Processing Unit.) That's that big metal box with all the wires coming out of it. Now, I could go on forever here describing the bits and pieces that make up a computer. However, if you really don't understand what I've been saying here about computers then you need to get some help, right? HOW your EMAIL program works. HERE.. the fundamentally important computer programs, other key components... and their inner workings are made very easy to understand. All the information is written in plain Geek-free English. P.S. You can read more about the WINDOWS Operating System and its history... and get additional user information on it by clicking on the links below. These above are some of the basic understandings related to the computer knowledge you'll need to run a web business. HOWEVER... this site is not focused on basic computer knowledge, it's focused on web business. If you're just learning it is advised that you seek professional help at a college or institution near you. 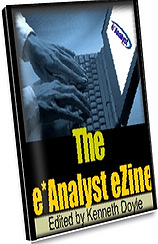 In the interim, if you're interested in running a business on the web, then subscribe to The e*Analyst ezine.